I’ve never eaten an authentic Sabich (sounds like SAH-beesh) from a street vendor in Israel. But I like to travel with my taste buds, so I dug into research to learn more about this popular sandwich. 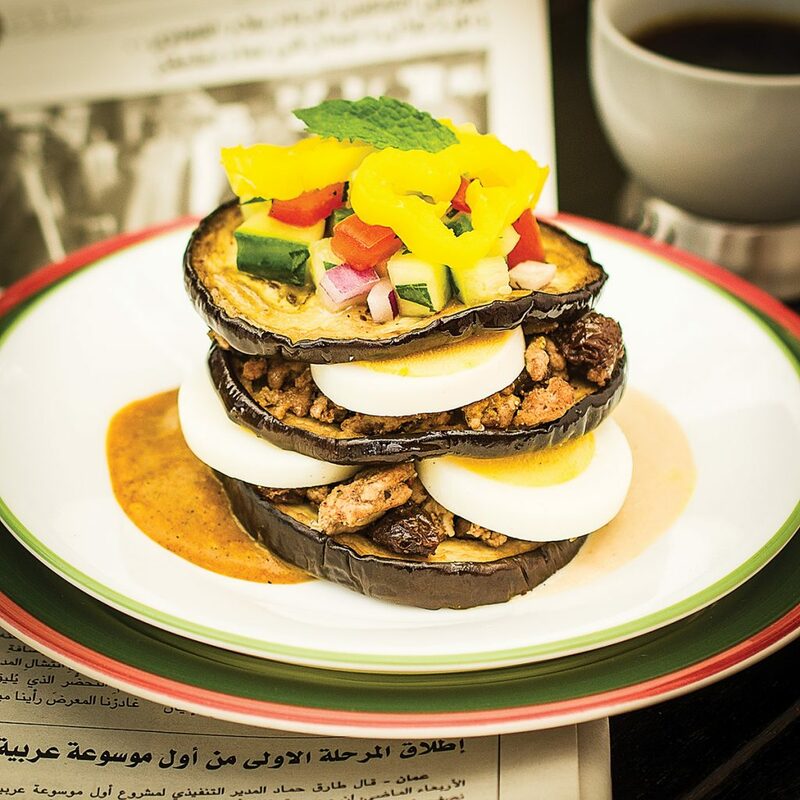 I read many magazine articles (like this and this), and all of them gushed about this irresistible combination of roasted eggplant, hard-boiled eggs, amba sauce, and tahini. I also learned that there’s some dispute about the origins of its name—I love a recipe with a mysterious past! Like most traditional cuisine, each cook customizes the recipe, so I added spiced lamb to mine to increase the protein—but you can also enjoy a vegetarian version by omitting the lamb and increasing the number of eggs. Sabich is really perfect Cookup food! All of the components can be made in advance then assembled when it’s time to eat. According to Jewish custom, there’s no cooking on the Sabbath so sabich is a popular meal because it can be assembled from pre-cooked ingredients—thus keeping custom and eating well. This photo from my cookbook Well Fed 2 shows the sabich as a pretty stack—but you can also throw it into a bowl and get messy! Sweat the eggplant. Cut eggplant into 1/4-inch thick slices. Sprinkle the slices aggressively with salt on both sides and place in a colander or sieve to sweat for 30 minutes. Prep the relish. In a medium bowl, mix olive oil and lemon juice with a fork. Add cucumber, tomato, parsley, and red onion. Toss to combine, then season with salt and pepper. Set aside. Brown the lamb. Heat a large, nonstick skillet over medium-high heat, about 3 minutes. Add the lamb and cook until browned, breaking up big chunks with a wooden spoon. Add the onion, garlic, and raisins. Cook until the onions are soft, 5-7 minutes. Toss in the cumin, oregano, mint, Aleppo pepper, salt, and pepper. Stir to combine and cook until fragrant. Assemble! To serve, place eggplant slices on a plate and top with lamb, relish, and other optional garnishes. Drizzle with sauces. Replace the lamb with ground beef, ground turkey, or a combo.